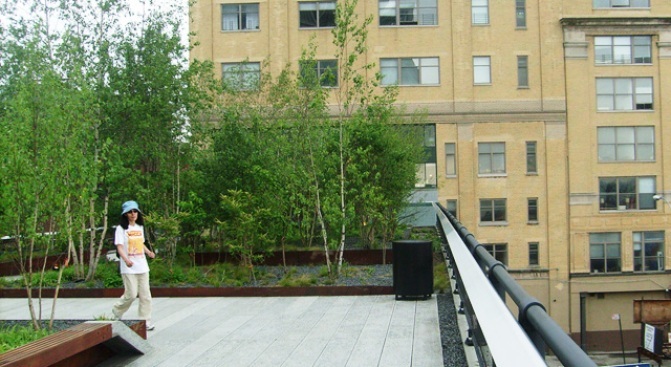 New Yorkers are finally getting their first look at the Meatpacking District's High Line park. Check out the opening in photos. The new High Line Park, an oasis of calm in the MeatPacking District. "I was overjoyed this weekend when I climbed the stairs at Gansevoort Street, entered the new city park and felt an immediate sense of calm. [...] [It is] a series of low scruffy gardens, punctuated by a fountain and a few quiet lounge areas, that unfold in a lyrical narrative and seem to float above the noise and congestion below. It is one of the most thoughtful, sensitively designed public spaces built in New York in years." Gothamist called for reader photographs of the new park -- check out their gallery here.